September, for many, marks the real start of the season. This is especially true for western hunters where elk, bear, antelope, and deer all open up essentially at the same time, making for one hectic month! In the September issue we try to cover the highs (and lows) of the various species in our annual forecast — something we have done for years, giving hunters the straight scoop on what to expect in the coming season. The good news is that big-game numbers are on the upswing, and as long as crooked politicians don't succeed in "transferring" federal lands to vocal, disgruntled states (disposing of your hunting lands for good), opportunities for DIY hunters on public lands will still be good in 2016. All that said, we are still seeing stagnation in numbers of hunters. While the last USFW survey showed a slight uptick in license sales, overall the number of hunters hasn't changed very much. Why is this? The answer depends upon whom you ask. It's lack of opportunity, shifting demographics to a more urban society, a societal pressure against hunting, the high cost to get involved. I'm sure all these answers have validity, but I believe it is much simpler than that. I believe some of the decline is due to laws and regulations being so complicated that most new hunters, youth or adult, have no idea where to begin. 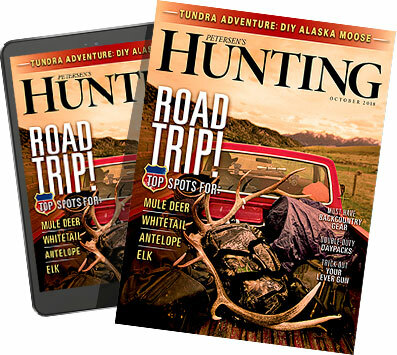 We recently received a letter (published in this issue) asking, "How can one start hunting?" Unfortunately, the answer is not simple: find a local Hunter Education class, sign up for it months in advance, attend several hours of courses, take a test, then go out and buy a license. That's just to get started. Where to hunt, how to hunt, how to find public land, how to clean an animal if one is successful, etc., are such complicated topics that I can't imagine jumping into the sport if I didn't have a father to show me the ropes. This all comes back to mentoring — something that is required if we are going to get new hunters involved in the sport. Luckily, some states have recognized this problem and have actually implemented programs to simplify the process. Fully 35 states have passed legislation or currently offer some sort of mentored hunting program where first-time hunters can delay going through Hunters Ed. provided they are hunting with a licensed hunter. "To do your part this season, make it a point to find a new hunter and take them out. It is good for the future of our sport, it is necessary for the new hunter&apos;¦"
Essentially, it is a "try before you buy" system that reduces the barriers to entry. Much of the thanks for this push can be attributed to the Families Afield program — a joint partnership between NSSF, National Wild Turkey Federation, and the Sportsmen's Alliance that was started in 2004 and to date has brought over one million first-time hunters into the sport. Some states have taken this mentoring program even further to encourage first-timers to get involved. Take Idaho, for example: Of all the states that have actually set up some sort of a hunter mentor program, Idaho, in my opinion, has set the gold standard with its Hunting Passport program. In a nutshell, any first-time hunter (over eight years of age) from any state who has never had a hunting license qualifies for it. You can buy a license for only $1.75 (and tags for non-resident youth can be obtained at resident youth pricing), without any Hunter Education course, with no maximum age (meaning first-time adults are encouraged to participate) as long as you are hunting with a mentor. to be successful when they go on their own. This program gets people into hunting easily, learning the ropes firsthand from an experienced hunter. If the newbies like the sport, they can then take Hunter Education, buy a license, and head out on their own. I can't think of a better program to help bolster our ranks, and more states should adopt a similar system. To do your part this season, make it a point to find a new hunter and take them out. It is good for the future of our sport, it is necessary for the new hunter, and more likely than not, it will be enjoyable for you as well.